The process of actually DOING the art should be the motive, not the end project. 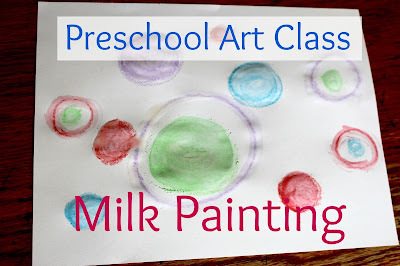 Preschoolers should be encouraged to use many different art mediums in many different ways. A child should be able to use his/her own creative expression to create a unique work of art. The opposite of this would be an art project that has specific step-by-step directions leading to a specific, one-size-fits-all end result. Expecting a preschooler to glue tiny pieces and parts onto something or to use small motor skills to create an intricate design will only cultivate frustration and feelings of failure...in you and them. The larger the canvas, tools, and space to create, the better. Here is a simple afternoon art project that definitely meets those goals and one that can easily be squeezed into the harried homeschool day. Encourage your child to use the chalk to draw a picture on the sheet of art paper. Once he has completed the entire picture to perfection, instruct him to paint over his designs with the milk/cream. He may use the bowl of water to rinse out the brush between each new color. With the addition of the milk, the chalk will begin to take on a glossy shine. Set the project aside to dry completely. Once it has thoroughly dried, the chalk will look like a milky paint.